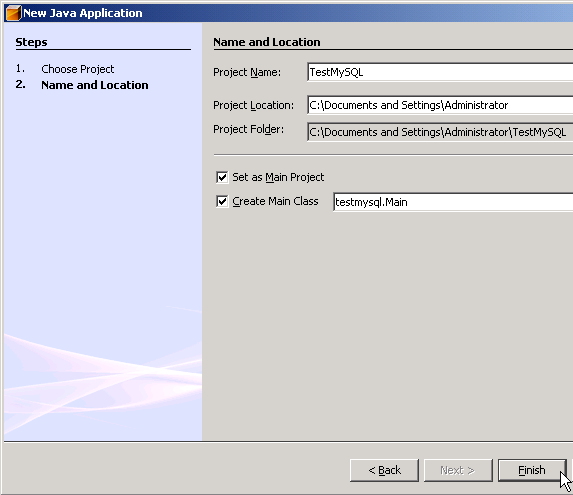 This tutorial show you how to use NetBeans to connect MySQL by using MySQL Connector/J, MySQL AB’s JDBC Driver for MySQL. This part which youâ€™re reading shows about how to establish a connection between NetBeans and MySQL. 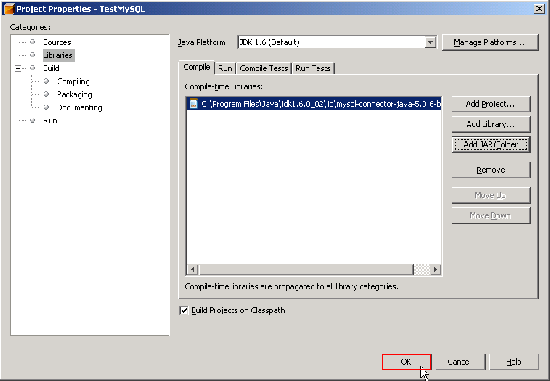 This part show how to perform some basic operations from NetBeans to MySQL. For instance, send querys as SELECT, INSERT, UPDATE to a database. 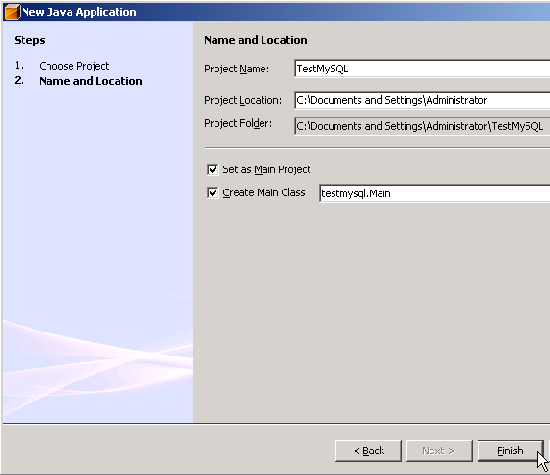 NetBeans with JRE (Java Runtime Environment). 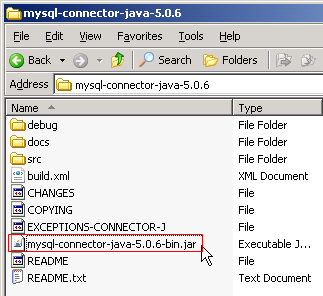 Extract the zip file to a folder, you’ll see file ‘mysql-connector-java-5.0.6-bin.jar’ which is the library file that we want. Just copy the file to the library folder, for example to “C:\Program Files\Java\jdk1.6.0_02\lib” directory. Add JDBC Driver to the project on NetBeans (Add a library). 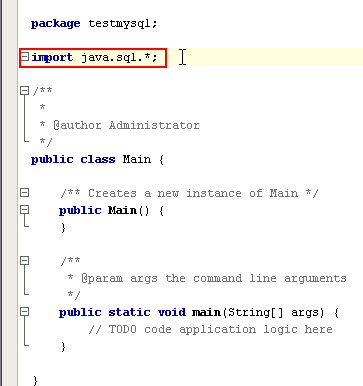 Next, I create a new Java project on NetBeans named ‘TestMySQL’ and add ‘mysql-connector-java-5.0.6-bin.jar’ that I’ve just extracted from previous step to the projectâ€™s library. Create New Project called TestSQL. 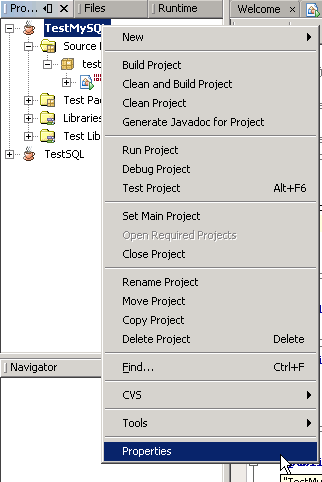 In Projects window, right click the project name and select Properties. Project Properties window appears. The Categories on left side, select Libraries. And on right side in Compile tab, click Add JAR/Folder. New Window appears, browse to the file ‘mysql-connector-java-5.0.6-bin.jar’ and click Open. Youâ€™ll see the .jar file was added to the project. Click OK to finish. Note: You should keep mysql-connector-java-5.0.6-bin.jar in the directory that you wonâ€™t delete it (ex. not in temp folder). May be in the same directory that keep common library files. If you delete the file without delete a link from the project, the project will show error about missing library. Now I’m going to write some code to connect to MySQL database. I have configured MySQL service on localhost. Iâ€™m going to use Connection and DriverMapper Classes so I need to import libraries. I’ll connect to MySQL Server on local machine, the mysql database(a default database in MySQL). In main method, add the following code. Class.forName(“com.mysql.jdbc.Driver”); means load the MySQL driver. “jdbc:mysql://localhost/mysql?” + “user=root&password=123456”; is a connection string that tells to connect MySQL on localhost, select database named ‘mysql’ and user/password for MySQL server. If you would like to connecto to other database, simply change text ‘mysql’ after ‘localhost/’ to your database name. Compile and run the project. If no error occurs, it means that the connection has established successfully. Next part, I’ll show to how to perform some basic SQL operations to MySQL. i’m doiong a basketball scoreboard with it control panel on javabeans so any idea about how to connect a java application to mysql! not connecting netbeans to mysql . i’m facing some difficulties in solving this problem so would you please provide me help or send me a useful tutorial about the subject ..
You above mentioned article is very informative. Especially for learners it is very helpful. Keep up and I am waiting for 2nd part. hey all thank for your help!!!! i did the link according 2 this article and itis working..
i have another question: Does anyone know how can i connect 2 different GUIs, i want 2 link a control panel with it corresponding basketball scoreboard, i want the data to change on scoreboard each time i change it from the soreboard..
I’m not sure that I understand your question correctly. If you have data displayed on more than 1 output, I suggest using Timer to periodically update your data on each output. Thank u Linglom!! the thing is i want to update the scoreboard each time i have an action performed on the control panel. I’m connecting the control to a database implemented on MySQL and i want the scoreboard to retieve data from the database each time i modify them from the control. this project is what we call an MVC model( Model View Controller)any IDEAs?????? Thank u again for ur help..
where “User” and “Password” were registered in the MySQL server, and it connected fine. Also, I don’t have a db yet, so I left out the db name. Thanks again for taking the time to post your example. Sorry for late answer. You can implement Timer class to refresh your data on scoreboard on every x seconds. Thanks a lot for this great blog. Simplified access to Mysql. How can we hide the database username and password in the source code. If you’are using SQL Authentication method as in my example, you have to store username and password somewhere in the program maybe in code or external configuration file. Another way, you can use Windows Authentication method which authenticate by using the current user’s credential (user that execute the application) so no need to specify username and password in application. 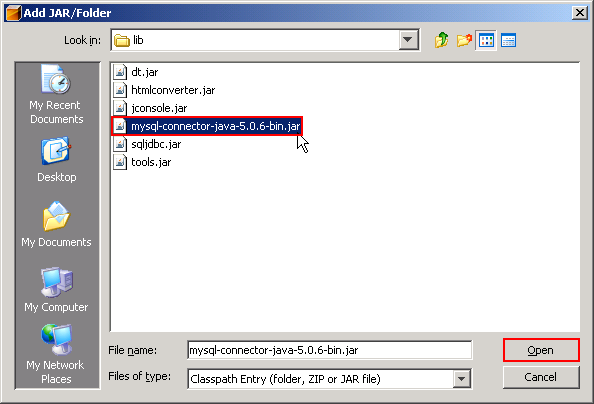 Hello, I’m a completely new to Java and netbeans, I downloaded the MySQL Connector J 5.1.6 and added the address of the file in my CLASSPATH `enviroment variables`(I’m using Windows XP) , but Netbeans wasn’t able to load the drivers to connect to MySQL. I have followed your example and it works very well. So just would like to know why this is not working with the CLASSPATH method out of curiosity! 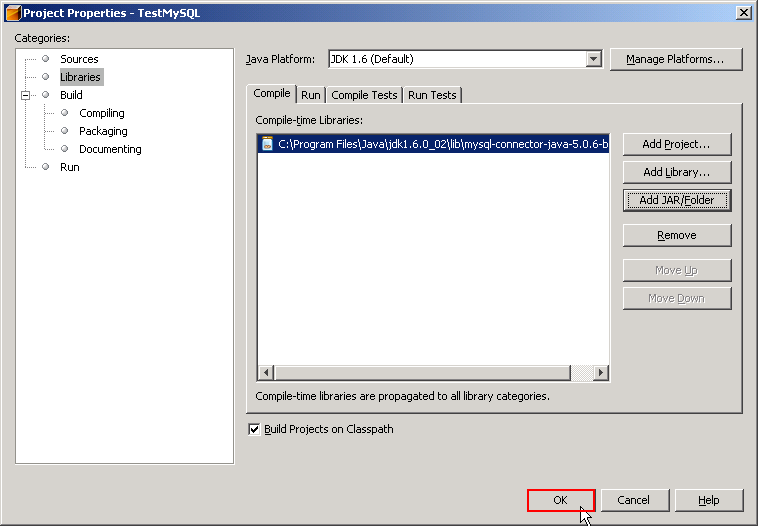 I had done it already using jdk directly but could not accomplish this without this tutorial. Thanks a lot. Thanks a lot PRO for this cool, tutorial. I have wasted a full day to know how to connect to an MySQL database using Linux UBUNTU, but I didn’t know how. But by reading your tutorial it made things very simple. Hello people, just to inform you all, what is in this tutoriel are the basics…because to use a database in java you must includes the jdbc driver for the corresponding database server in the application classpath. I’m facing a problem which can’t let me remotely connect to MySQL i-e:I have an application installed on different employee computers and the database installed on a server. So i have to enable remote connection for all IP addresses to my mysql instance…any idea please? how would connect a MS ACCESS database using the Desktop Application route in Netbeans. I have waisted my time using the other tut (http://www.netbeans.org/kb/55/mysql.html) it works locally, but didn’t work when I tried to publish it. Same as Yasir’s comment.Have done it through JDK but creat problem, when I run it through Netbeans. Now resolved. Hey…Thanx Very mch..this is so helpful!! Why ? It almost 1 week i’m searching for solution, but I can’t get one. great, thanks a million. Just started using netbeans, and the tip about importing the library for postgres was a life saver. Best explanation I’ve read so far…thanx! I have tried that but I can’t remember much. I think it’s not flexible as coding by self. need help with ms access – binding table , radio button , etc. There is a tutorial for connect ms access at netbeans.org (http://wiki.netbeans.org/ConnectingToMsAccessDB). THANK YOU! It was very helpful. I tried it and it’s still not working for me =( What should I do next? I’ve tried to copy the .jar file to each lib folder, both in jdk and jre. THANK YOU SO MUCH! I have been missing the “properties add JAR” step and this is the first time I have seen it after 2 days of looking online for a solution! a) display all records from the DB to a jTable – and to show changes made to records on the table. c) how do program a print button – to print records from a MS DB. im trying to connect using no password. can you please tell me the correct connection url?? i m using same without using ny password. What SQL Server edition you are trying to connect to? If it is SQL Server Express, have you enable remote connection? Using the snippet provided above I’m trying to retreive the contents of the Database table Person. I’ve already created the table using mysql. But as soon as I execute this I’m getting the following exception. If you are still referencing to the ResultSet object, do not close the Statement object yet. For this example, move the code “stmt.close();” to the bottom after the do-while loop should fix the problem. I have NetBeans 6.5 IDE on ubuntu 9.04. Please tell me where to copy-paste jar file. You don’t need to place the jar file on java folder. You can place any folder you want because you will browse to the file later by yourself. For Linux, the default java path should be /usr/bin/java. This information really helped me out. SQL Exception: java.sql.SQLException: Communication failure during handshake. Is there a server running on localhost:3306? It says Build is sccuessful but also says failure handshake. Can you please let me know if the connection is successful or not? Try to change the authentication method at the MySQL server. Thanks for this tutorial at last i have found a good one, a step by step one, not a “check the documentation” one. hi, I face some problems. Hope can get a solution. Thanks in advance. For the second problem, try to change the hostname in the connection string to ip address, try both 127.0.0.1 and your network ip address. I’m not have experience with mobile application. But I think the code for mobile application should be simialr with this example. My problem seems hard to be solved. Anyway, thanks for your help!!! bro, my problem has been solved already.. Thank you very much. I could not connect programmaticly to MySQL even though I could connect through the Services tab. The solution is to add the JAR file that contains the MySQL Connector. You describes how to do that step. Once I added the JAR file, everything worked. Thanks Sir,It was of great help for me ……. Last packet sent to the server was 32 ms ago. I suggest you see the comment 73. The error message stated that you had provided with the wrong password for user ‘root’. You need to change user name and password to the correct one in the connection string. I was terrible upset for I was not able connect to Oracle DB using netbean. Your lesson part one and two has given me breather and I am so happy that I am able to connect to Oracle. Your style creating a class with a connection method, object creation to get connection is excellent. hey every1 cn u hlp me nd suggest a topic for my proj for the subj “INFORMATICS PRACTICES” m in 12th standard ryt nw…!! rply..! Thanks for your info! it’s helpfull. I showed how to add a library on this post on step 2 of this post. A project will be stored on the path that you define when you created it. Hi, i found the reason. When i installed Netbean, i set it link to jdk 1.6. But, jdk of my debian is the version 1.5. So, when i built to jar file and run , it’s not worked in jdk 1.5. I updated jdk to version 1.6 and it’s worked ! i was struggling with this………..
is dis query writing z correct. Verify if that username and password is correct and it has sufficient privilege to access the selected database. I am new fool in Java world. I started learning JAva and servlet. 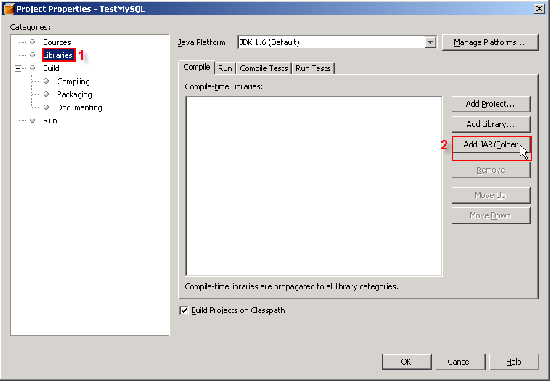 I used mysql using eclipse after installing connector J but the code from netBeans was not working. I could not understand why I need to add the file in project lib when I have added that jar file in path. Hey friends. Thanks for all this information. I am new in Java programming and this information helps me a lot. Thanks again. Whoaa dude, you’ve saved me a lot of nerves and hours with this. Goes to bookmarks for me! This was really helpful, straight to the point. Thank you. thanks so much this one is really helpful to me otherwise i had to face lot of problem and thanks again !! my problem is that when i am connecting my to netbeans,there is an occurs in creating ReultSet objects. code is showing that ResultSet method is not found,it belongs to java.beans.String. I imported java.beans. *; but the problem is not getting solved. because of my problem all options available with ResultSet object such as executequery and executeupdate are not coming which are essential for fetching data from database. I need help in connecting a database (mysql) to a java web application. Please help by giving me an idea on how to go about it. I don’t have an idea. Thanks for ur wonderful tutorial. Saved lot of my time. But the problem is that the Tables folder remains empty. I have downloaded and re-installed sakila multiple times but problem is not solved. Please help. Thanx. can u please help me in getting through this problem.. Thank you very much for this simple and effective tutorial. It just works when done step-by-step. .can anyone help me out.? Thanks a lot 🙂 🙂 very easy to do connectivity. Have you add MySQL Connector/J library to your project and “import java.sql. *;” in your code? Can you show the full error message? It helped me a lot. Thanks! This tutorial was really life saving..
thanks for this information this will definitely helps me a lot. Awesome! This was just perfect! what does this statement means? Thank Thank Thank you and Thank you sir…. Connected Database doesn’t containt Tables.. Most likely, you did not set credentials for your MySQL server. By default, root account does not require a password when connecting from localhost. You can either create a new account with a password and use that account instead root or set new password for root account. Never seen this problem myself. Have you verify that your database that you’re connecting to has some table? I need a topic 4 my XII project. Please help me find it . so please if anyone found the error or have the solution i will be so much thankful ! I got the communication link failure error when i connect to my Linux,MySql environment,at last i found the problem.I disabled the Firewall from Firewall configuration. now its working fine. this is good quiry but give more quiry of java. thanks a lot 4 this guide, i solved the problem i had with nullPointerException generated by Class.forName(“com.mysql.jdbc.Driver”) . I missed the jar connector file in my project! I am running NetBeans 7.0 on Windows 7 and am trying to use a servlet to access a MySQL database. I have followed your instructions for the driver installation (mysql-connector-java-5.1.18-bin.jar) and that all seemed to work correctly. But now NetBeans say there are 10 different files in the driver software that have syntax errors. For example, in CallableStatement.Java in the first directory. i need the code for timer in java netbeans for my project. Hi I have been trying to connect to mySQL database for a long time in vain but today i tried this magnificent and simple code and it worked. Thanks alot and may God bless. How to install JDBCMysqlDriver Library on Ubuntu. i tried following the way it is done in windows but nothing is happening. i use Mysql through the terminal of Ubuntu. is that the problem? could you please tell me how to resolve this bcoz i really need it to complete my school project due next week. “jdbc:mysql://localhost/thread.sql?” but it gives above error..
hello everyone, can you please help me determine what’s wrong.i follow the instructions, then when i run the code that is the output. i added jar file,bt still not working..error as no driver found..what to do????? as per step 3 i clicked to the button add jar file but it cant open the new window so i can add the jar file….. I have an error like this please help me……..
“Class Not Found Exception: java.lang.ClassNotFoundException: com.mysql.jdbc.Driver”…………. also i created 4 jframe in the same package when i click the button in the first one the second must show up but it doesn’t.so what i must do?? ?please help me because this application is for the stage!!!! Anytime number of operations exceeds the transaction size as asked in the beginning, commit then and continue.
. At exit, commit the transaction even if number of operations carried as per menu is less than the transaction size chosen at the start.
. If working in team, ensure that both the USN numbers are mentioned as the comment in java code. Ideally, it would be better to run the program from one account, and use DB of other USN.
. No fancy GUI required. Simple standard console input/output would work. Thanx this article was so simplified and straight forward ,im impressed thank you. thanx buddy u made it quite simple!!!!!!! I am completely new to netbeans and mysql database.I have done all this still it is not working. Do i have to do ODBC jdbc CONNECTION in ctrl panel? and SHOULD I start mysql server? If so how to do it? I am trying to connect MySQL5.1 in Netbeans7.0.1 RC1 build in Windows 7. But there connection refused error has been occured. In Services –> Database –> RegisterMySQLServer i have given this details. But connection refused error is coming. I checked jar file placed in correct place. And using mysql-connector-java-5.1.13-bin.jar. where are the gui for the above coes?????????????????????????????????????? Itz very helpful. I think my problem is getting solved. 🙂 Waiting for the 2nd part. Thanks a lot. I am making a project on payroll management system ,myself, for college project..
i am facing a problem.. Does n’t work(when i type it show error) in NetBeans IDE 6:5:1 verson..
in login.java when i click login button it open wellcome.java but i want to close login when welcome open.. I have a problem during connection to jdbc. it is showing this–java.sql.SQLException: No suitable driver found for mysql://localhost:3306/company. I am totaly confused what to do. Can you post your code snippet (the connection part)? This error message could be that the JDBC driver is loaded properly, or the JDBC URL is wrong. Try to add this code before the connection. i wrote the code below and everything went normal ! The error message tells that the user that you’re using doesn’t has permission to access database. Make sure that you have grant permission for the user on MySQL server. See this post as example. A special thanks to you guys to post I made on the 17th June. I could connect to the database but the picture (passport is not displaying only the name of the passport is displaying in the form). Please anyone help on how go about this.